Lino has lived in Chicago for much of his life. His love and extensive knowledge of this great city has culminated a number of cultural gems. Below, you will find a list of "hotspots" which come highly recommended. Presented are a few local restaurants I thoroughly enjoy. Their selection was based on exemplary experiences. 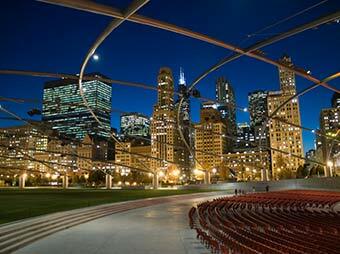 From comedy to tragedy, Chicago boasts world-class theater performances all across the city. Below are stages that present the very best shows. This is a must-visit for Midwest history buffs and anyone who enjoys history exhibits and old photographs! In the beautiful Cultural Center (formerly the Chicago Public Library) is the Museum of Broadcast Communications, where you can experience American history through the sights and sounds of television and radio. The museum has a wonderful archive of the old Chicago favorites such as Fibber McGee and Molly, as well as its own closed-circuit television studio for playful newscaster auditions! (of natural history) Read about Sue, the largest, most complete, and best preserved T. Rex ever! Fascinating sky shows in person and a good Web site for heavenly information. Controversial for importing beluga whales from the ocean, the Shedd is nonetheless impressive for its collection of nearly 8,000 aquatic animals and its exhibit about the ecological balance of the Amazon River. A little further south near 55th Street and Lake Shore Drive is the Museum of Science and Industry. This museum was originally the Palace of Fine Arts at the 1893 Columbian Exposition. View the online exhibits of the U-505 as well as age-old favorites: coal mine, baby chicks, and Colleen Moore's Fairy Castle. This is a favorite of mine because my parents immigrated to Chicago from Lithuania in 1920. The museum is one of the nation's leading ethnic museums, and it is a valuable resource for Lithuanian geneology. Visit in person at 6500 S. Pulaski, Chicago 60629; phone: (773) 582-6500.